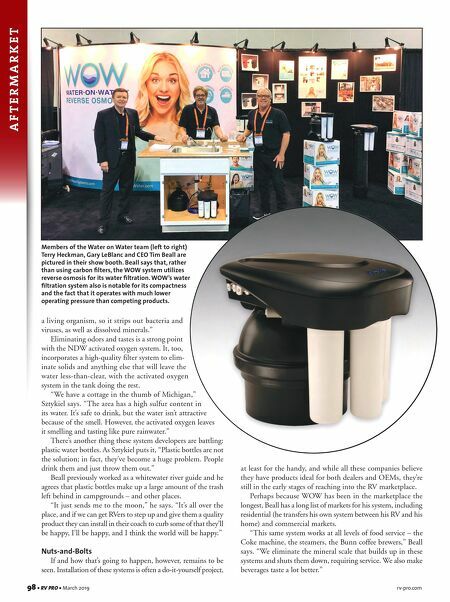 98 • RV PRO • March 2019 rv-pro.com A F T E R M A R K E T a living organism, so it strips out bacteria and viruses, as well as dissolved minerals." Eliminating odors and tastes is a strong point with the NDW activated oxygen system. It, too, incorporates a high-quality filter system to elim- inate solids and anything else that will leave the water less-than-clear, with the activated oxygen system in the tank doing the rest. "We have a cottage in the thumb of Michigan," Sztykiel says. "The area has a high sulfur content in its water. It's safe to drink, but the water isn't attractive because of the smell. However, the activated oxygen leaves it smelling and tasting like pure rainwater." There's another thing these system developers are battling: plastic water bottles. As Sztykiel puts it, "Plastic bottles are not the solution; in fact, they've become a huge problem. People drink them and just throw them out." Beall previously worked as a whitewater river guide and he agrees that plastic bottles make up a large amount of the trash left behind in campgrounds – and other places. "It just sends me to the moon," he says. "It's all over the place, and if we can get RVers to step up and give them a quality product they can install in their coach to curb some of that they'll be happy, I'll be happy, and I think the world will be happy." Nuts-and-Bolts If and how that's going to happen, however, remains to be seen. Installation of these systems is often a do-it-yourself project, Members of the Water on Water team (left to right) Terry Heckman, Gary LeBlanc and CEO Tim Beall are pictured in their show booth. Beall says that, rather than using carbon filters, the WOW system utilizes reverse osmosis for its water filtration. WOW's water filtration system also is notable for its compactness and the fact that it operates with much lower operating pressure than competing products. 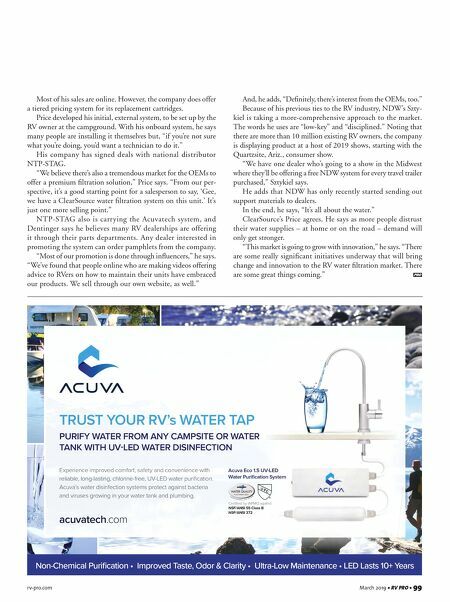 at least for the handy, and while all these companies believe they have products ideal for both dealers and OEMs, they're still in the early stages of reaching into the RV marketplace. Perhaps because WOW has been in the marketplace the longest, Beall has a long list of markets for his system, including residential (he transfers his own system between his RV and his home) and commercial markets. "This same system works at all levels of food service – the Coke machine, the steamers, the Bunn coffee brewers," Beall says. "We eliminate the mineral scale that builds up in these systems and shuts them down, requiring service. We also make beverages taste a lot better."